The majority of our quality office chairs are guaranteed for 5 years. This is an important consideration bearing in mind the constant use of an office chair. Chairs need to be able to comfortably seat a range of users with multiple weights and heights. A quality mechanism and additional features such as Seat Slide and Inflatable Lumbar support ensure the chair can provide an ergonomic fit for any user. Seat Slide is a useful feature enabling the chair to be altered to accommodate users with a range of legs lengths. See our mechanism guide. You can choose chairs with arms or without. Arm types include Fixed Arms, Adjustable Arms or Fold Back Arms (ideal to accommodate the preferences of different users). See the Rio task chair for an example of foldback chairs. This is really down to personal preference. An upholstered back may provide additional support but a mesh back provides ventilation. Low cost chairs generally have less features that restrict adjustment. We have chairs to suit every budget – without compromising on length of guarantee and can often provide chairs so that employees can evaluate them prior to purchase. If your chairs need to suit users of up to 150Kg (23 stones) you may want to consider the Posturemax chair range and if you have users of up to 200Kg (31 stones) you may want to consider the Posturemax 200. There is a myriad of choice and we can make suggestions and send you fabric samples to assist you. We can usually match existing furniture or desk screens if required. As standard all our chairs are supplied fully assembled prior to delivery and placed where you need them. We can supply boxed items as required. In some work environments chairs are used for 24 hours. In these siuations we always recommend a chair designed and manufactured for 24 hour use such as Ergonomic Task 24 or Posturemax. 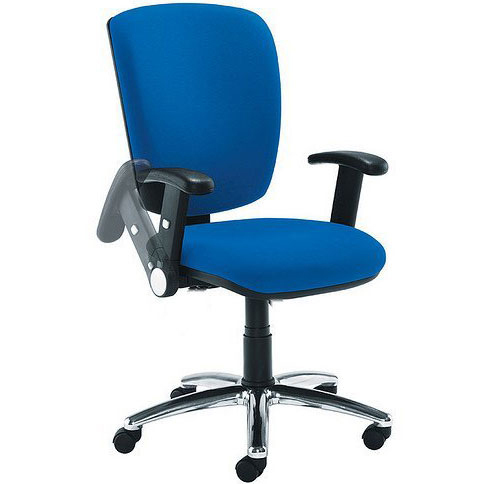 View our range of office task chairs here.